As we know that Surajkund Crafts Mela organized each year in Surajkund situated in Faridabad near to Delhi. It is a very unique fair also called as Surajkund Festival where talented artistes from different parts of the world come to show their crafts,finest hand looms, handicrafts, authentic fragrances and traditions of their respective states/countries. National and State awardee artisans from every corner of India comes in Surajkund Mela. 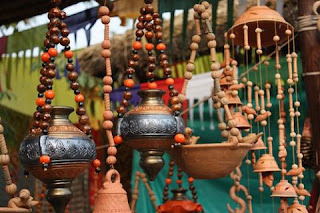 27th Surajkund International Crafts Mela is already started on 1st Feb 2013 and last date is 15th Feb 2013. This is organized by the Haryana Tourism Department every year.The Surajkund Crafts Mela also offers us to buy some great works of artists that contain paintings, wood stock, textiles, pottery, stonework and grass work. It has also offers some great fun activities like- Natyashala, folk dances, decorated musical evenings arranged at the fresco theater. The crafts persons from SAARC nations and Eurasian countries like Tajikistan, Uzbekistan and Kyrgystan would be displaying and selling the best of hand looms and handicrafts items at the 27th Surajkund International Crafts Mela.